If you’re looking for salon marketing ideas to promote your business online, have you thought about quizzes? I don’t mean a quiz to tell you which Disney Princess you are, but a quick and fun quiz related to your services which will engage your clients and encourage bookings. You can use quizzes on your salon website to turn visitors into clients. You can share them with your email list to promote your services in a fun way. And you can also use quizzes with Facebook ads to get even more clients through social media! This article will show you exactly how to set up a quiz for your salon, with examples, inspiration and step by step instructions. 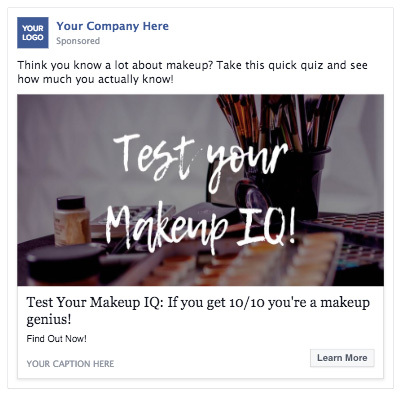 Whether you’re putting them in a Facebook ad, on your website, or sending them to your mailing list… quizzes are a fun and easy way to engage people! Plus, when you can get people to take action after the quiz (leave their email address or bring them to a booking page), you’re able to turn that fun into actual revenue and clients! Finally, quizzes are perfect for getting people familiar with your services as a beauty professional. Quizzes help to engage people in a fun, personalized way, and then lead them to your services while encouraging them to book an appointment. They’re also perfect for collecting email addresses. You can put a popup on your website that encourages visitors to complete your quiz. Then you can get them interested in what you do, introduce your services, and at the end get them to put their email addresses in at the end in order to see their quiz result. Finally, if you do Facebook ads, I highly recommend you try using a quiz in your ads. People love quizzes on Facebook as they’re often looking to waste time and be entertained. Give them a quiz that’s fun and easy and related to your services, and then grab their email address at the end. The first step is to understand your real goal in creating and promoting a quiz. What do you want to use your quiz for? To get more leads (potential clients) through Facebook? To get email addresses? To engage your email list and invite them to a certain service/promo you have going on? 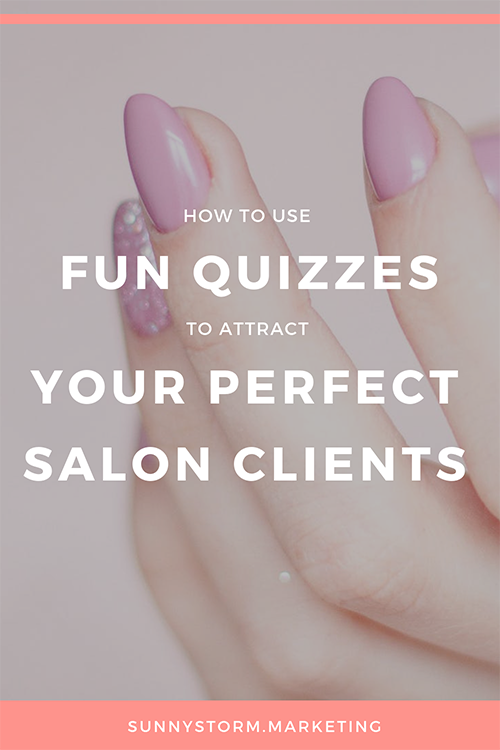 Quizzes can be so helpful for any of these things, and I hope this blog post will inspire you and help you decide where you can use them for your salon. Once you've decided that, you can get to the fun part: making it! Call to action: usually your call to action will be to book an appointment, either through your booking page or you can even link them to your Facebook messenger. Don’t waste the opportunity - you’ve got a bunch of engaged people that just took your quiz, now turn them into paying clients! How can you create your own quizzes online for free? Enter Interact Quizzes! This is honestly one of the easiest and quickest ways to set up a quiz for your salon or beauty business. If you want to try some other software, there is also Typeform and SurveyMonkey. The only catch with Interact? If you want to collect email addresses, you’ll have to upgrade to a paid version (which starts at $17 per month). But even if you use the free version you get a ton of features and options. So let’s jump in! 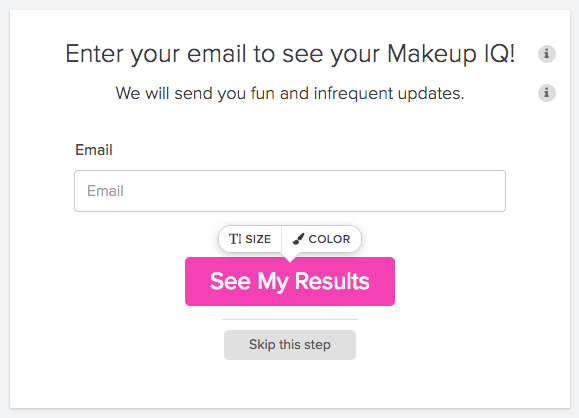 Assessment is like the Makeup IQ Quiz I showed you above. It grades you and gives you a score at the end. If you want to make your clients feel smart and accomplished, this one is perfect! Personality is by far the most useful type of quiz. It’s like the “which facial is right for you” or “what is your perfect eyelash extension” quiz. Depending on the answers they give, your clients will receive a different “personality” type. You want your quiz to stand out and reinforce your brand right? Of course! Before writing your questions and results, take a moment to choose your color palette, add your fonts, and a branded cover image for your quiz. It will make it so much more attractive! The best quizzes only take a few minutes to complete, and are easy and fun. So try to stick with 5-10 questions. What questions should you include in your survey? If you add photos to your questions, they will be even more attractive and engaging. Also, try to make both the questions and the responses fun and casual. The goal of the quiz questions should be to get enough information about your potential client that you can give them a result, but of course it doesn’t have to be super complex. It’s better to keep your quiz entertaining than scientifically correct! Now it’s time to create the “results” of your quiz. If you’re doing a personality-style quiz, I recommend that you create 3-5 "personality” results. These could be 5 different nail styles, 3 different facial types, 4 different lash extension styles, or anything you like! Create a title, add a photo of the result (perfect for showing off some of your work! ), and include a fun description. Don’t publish your quiz just yet, as tempting as it may be! Remember that the real goal of this quiz isn’t just for fun, it’s to get more bookings and clients for your salon. How exactly can you do this? Direct people to take an action at the end of your quiz. If you’re using the free version of Interact, you can still use the results page to encourage people to book with you. At the of the the results description, relate the result to an action, such as “Want to get perfect almond nails this week? Click below to book an appointment with me now!" Step 4: Promote your quiz! Now that you’ve created your quiz, it’s time to promote it. As I’ve mentioned, the three main places that you should use your quiz are on your website, through Facebook ads, and to your email list. Let’s look at how you can do each of these things easily using Interact Quiz Maker! I’m sure you have people visiting your website regularly from social media and Google. But you know the problem with websites? Most people visit them and then jump off, and you’ll never hear from them again! If you can quickly engage visitors before they leave your website, collect their email address, and also encourage them to book an appointment, you're golden. To embed your quiz on your website on Interact Quizzes, go to “Share & Embed” beside your quiz and select “Promote as a popup on your website”. There you can either email the share code to your website developer, or if you have a Wordpress website, you can install the Interact Plugin on your website (it’s actually really simple). I hope that you’ve been collecting email addresses and sending them regular updates via email! Email is my favourite way of branding your business and sharing helpful and inspiring content, all the while increasing your bookings. If you want more ideas for salon email marketing, check out my blog post here. Sending a quiz to your email list is a really easy way to get more bookings, and I guarantee you’ll get lots of responses. Just include a screenshot of your quiz and include a link to it. Write some intro text (and of course make it really personal!) and include another link at the bottom within the text - I always recommend linking more than once within an email. Send the email out to your list with an attractive subject line, and watch the responses (and bookings!) come in! If you’ve been experimenting with Facebook ads for your salon and you want a new way to grab attention, you just found it. Facebook ads are an important part of salon marketing, and the best ones are entertaining, educational, and personal. A quiz is all three of these things! To set up a Facebook ad, select “Share and embed” beside your quiz and follow the instructions. You’ll need to create an ad in the ads manager that gets shown to your target audience. If you want to learn more about setting up amazing Facebook ads for your salon, read my blog article here. Quizzes are the perfect way to promote your salon online, and you can easily get started for free using Interact Quizzes. Make your quiz fun and easy. Don’t make it too difficult or people won’t finish it. Also, give your questions personality and make them fun! Do you want more ideas for salon marketing? How about creating a strong and beautiful visual brand! Download my salon branding eBook where you'll get a ton of ideas and inspiration for your logo, colors, designs and more!